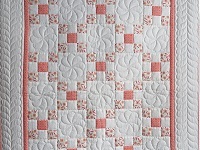 Connie's quilts have a quiet elegance. 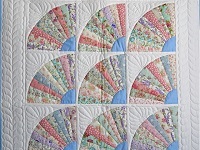 She has a gift for making more of traditional designs by using fewer different fabrics and incorporating more "white space". 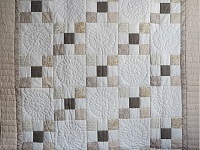 A quilt with many different fabrics and a complicated design makes one feel unsettled. A simple pattern with just one or few colors is calming and creates a peaceful environment. 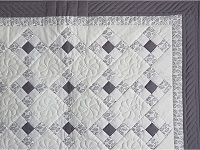 She loves to make quilts that will bring a feeling of tranquility to your world. Connie's piecing is also outstanding. She is very precise and gives attention to every detail. 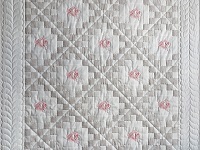 Each of Connie's quilts are made individually by her and most are hand quilted by her mother. 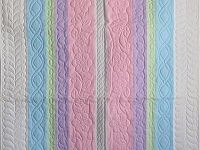 She and her mother are experienced quilt makers, working together for almost two decades. A young Mennonite woman, Connie lives with her husband and two children in Pennsylvania. 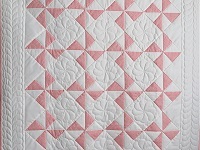 Quilt making is one of Connie's favorite activities. In addition to quilting she enjoys hiking and observing the colors of nature, spending time in her kitchen and listening to classical music. 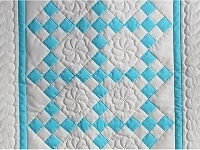 A traditional nine patch pattern made in the wonderful color combination of aqua and natural. 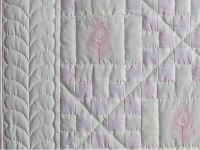 Excellent piecework and beautiful, fine hand quilted stitches. 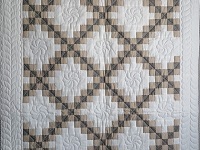 The back of the quilt is covered with the same natural colored fabric as used on the front. Made by Pennsylvania quilt maker, Connie Lapp, and hand quilted by a friend. Would make a great baby quilt!